You are here: Home / Health & Fitness / How Do I Choose a Bicycle For My Child? How Do I Choose a Bicycle For My Child? Bicycle is an essential attribute of our childhood: it becomes not only a means of entertainment. Riding a bicycle positively influences the development of the child, builds his dexterity, endurance and independence. It develops a sense of balance, coordination and an ability to navigate in space, and it strengthens his muscles. It is very important to choose high-quality and reliable vehicle that would be easy to use and that can ensure your child’s safety. According to CuteLittleDarling.com, bicycle manufacturers offer models that vary in design and appearance, features and material, characteristics and assembly. In this article we will go over the characteristics you need to focus on when choosing a children’s bicycle. Balanced bike – a transitional option between a two-wheeled bike and a tricycle. Not every child can quickly adapt to a two-wheeled bike after riding a tricycle. That’s when a balanced bike comes to the rescue. Models are made without pedals and are suitable for children from the age of 1. To ride it, the child pushes his legs off the pavement. Thus, he is learning to steer safely, without being distracted by the pedals. Besides, he can slow down easily, at any time, which is usually difficult for a beginner with a pedal bike. Products with training wheels are great for learning to maintain balance when riding, and they provide a safe transition to a classic two-wheeled bicycle. The training wheels protect the bike from falling on the side. In addition, they provide safe braking. And when the kid feels confident and is not afraid to ride, you can dismount the wheels and ride a standard two-wheeled bicycle. To choose a quality, practical, reliable and safe bike for your child, you should pay attention to a number of factors. First of all, it is the age and height of the child. Choose the design that is appropriate for his physical development and age. But remember, not all children grow up according to general statistics. Therefore, the most important characteristic is not the age, but the height of your child. The best option is to choose the product with an adjustable height of the seat and handlebar. Then you can adjust the model in accordance with the height of your child. Special attention should be paid to the quality of used materials and the assembly design. Steel and aluminum frames are durable and reliable; they do not crack and serve for a long time. The aluminum frame is lightweight, so it is easy to ride such bikes. But these models are more expensive than those with a steel frame. For children there are models with rear and manual hand brake. The first type provides reduction in speed, while the second one is used for emergency and immediate braking. These brakes contribute to the riding safety. For rear braking they use foot brakes. The most important selection criterion is the size of the wheels. The choice should be based on the age and height of the child. Wheels with a 12-inch diameter are designed for children up to three years old, 14-16-inch wheels are suitable for children 3-6 years old. The models with wheels of 18-20 inches are recommended for children between the ages of six and nine, and vehicles with 24-inch wheels are designed for teenagers ages 9-12. Before choosing a tricycle with or without a handle, check whether it is equipped with the seat belts. They are required for small children ages 1-2, who have just started using this mode of transport. These belts keep the child in the seat securely. The child will not fall out or fall down. The belts should be soft but durable. 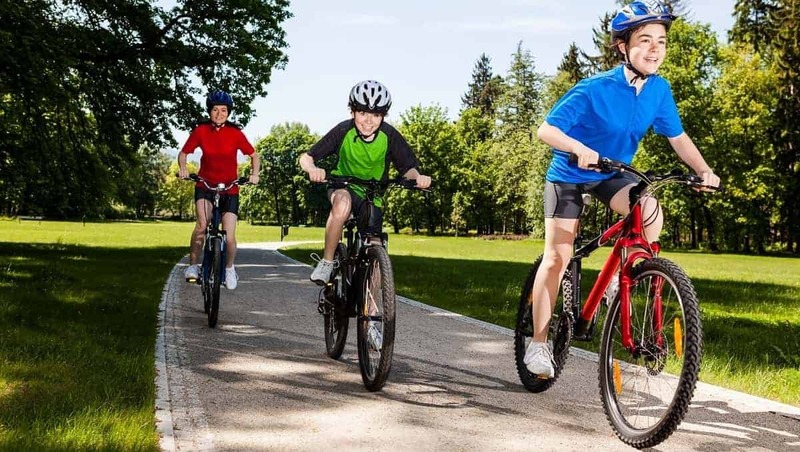 To choose a children’s bicycle by height, place the child over the frame, in the front part of the frame, so that the latter leans against the tailbone: the bike’s frame will be between the legs. A proper gap between the frame and the kid’s crotch should be about 4 inches. Sit the child on the seat and check whether it is easy for him to reach the pedals, he should not be slouching when riding. This “try-on” will help you to choose the most suitable model. Do not buy a bike “to grow into”! The model should be chosen in accordance with the height, age and physical abilities of your child. It is important that the child rides a bike comfortably and safely. Improperly chosen vehicle will cause problems with steering, as well as frequent falls and injuries. For children at the age of 2, who have just stopped using a stroller, you should choose a tricycle. For the smallest ones, a suitable solution would be a model with a parental control handle and a footrest, a sun/rain canopy, a deep soft seat and the seat belts. In addition, you can find models with a built-in music panel that will distract your child and contribute to his development. An additionally installed basket will allow you to take the necessary things on bicycle trips or store your purchases there. For children of two to four years of age we can choose tricycles without a parental control handle. It will teach the child to independently steer the bike. It is desirable that the bike does not weigh more than 4-5 kilograms, otherwise the kid will not be able to handle a heavy bike if it gets stuck or falls down. The most practical and comfortable are non-slip pedals that securely hold your child’s feet in place. A balance bike can become a sort of transitional stage. Such bicycles are often bought for children who have mastered a tricycle, but are not yet ready to ride four-wheeled bicycles. For example, according to many parents and reviewers of children’s products, the best bike for 3 year olds is the Strider 12 Pro. For kids ages 5-6, we choose four-wheel bikes with training wheels for safety. The handlebar and the seat in such products should be adjustable. The device must have a chain guard, a handlebar guard and the necessary reflectors. For 10-14-year olds you can buy teenage models and then move on to adult models. Stunt bikes with speed gear will be appropriate only for confident riders. Start the training with a balance bike. With its help, the child will understand what balance is, how to hold the handlebar and make turns. Do not forget about the helmet; if necessary, buy the knee and elbow pads. When the child is riding confidently and is not afraid of speed, you can change to a two-wheeled bicycle. Many experts believe that children that start with a balance bike do not need training wheels. Do not forget that the bike must be suitable for your child’s height and age, and also should be light. The kid will be able to easily lift the lightweight structure and quickly get off it, if the bike gets stuck. To make the weight of the device lighter, remove the heavy trunk, the basket and other unnecessary elements of the bike. During the first rides, support the child from the back or hold him by his clothes, but do not hold the bike’s seat! If you hold the seat, the child will not learn how to balance and maintain balance. Tell him how to control the pedals and to brake, how and when to turn the handlebar. Jump on a bicycle yourself and show your child how to ride correctly.